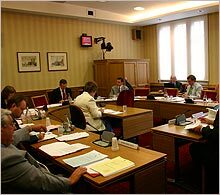 The Government seeks to respond to reports from House of Lords select committees, and joint select committees, within two months of publication. However, this deadline is not always met. Thus, for example, the Constitution Committee published its report on The Union and Devolution on 25 May 2016. The Government published its response on 7 March this year. I also served on the Joint Committee on the Draft Voter Eligibility (Prisoners) Bill, which reported in 2013. We are still waiting for a substantive Government response. Furthermore, when responses are published, the content is not always such as to make you think it was worth waiting for. Given this, I tabled questions last month to ask what the Government was doing to improve the quality and timeliness of Government responses and, over the past seven years, how many reports had not received responses within the two-month deadline. In replying, the Leader of the House, Baroness Evans of Bowes Park, did not respond on the point of quality, but did say she had written to Lords ministers to remind them of the importance of providing timely responses. She did not have the data for the past seven years, but she did reveal that no fewer than 15 select committee reports were still awaiting a response after the two-month deadline. The question includes a proposal which in my view is worth consideration; I am not aware of the proposal having been made previously. Accordingly, as any change to House of Lords Business would be a matter for the Procedure Committee, I intend to submit such a proposal for consideration at its next meeting. This entry was posted in Uncategorized and tagged Baroness Evans of Bowes Park, House of Lords Constitution Committee, House of Lords Select Committees, Joint Committee on the Draft Voter Eligibility (Prisoners) Bill, The Union and Devolution. Bookmark the permalink. Lord Norton, as the pin-up-in-oils for glass half-full parliamentarians, now might be the time to lie back and think of wheat fields. Gvt Departments don’t need any more input to be shamed (bar Defra). Gosh. A Minister being unusually helpful; Clearly the Xmas spirit (ahem) is working miracles. Without context of how many reports were answered its hard to know what to make of that. Surely there must be some data even for a shorter period.